(Somerville, MA) It’s very simple. If a man* cannot talk to a woman** then that man* isn’t good enough for that woman**. Effective communication is the foundation of any relationship. Anything less than efficacy will cause the relationship to fail. Burning is about how one such relationship failed more than just a pair of lovers. The apt summary from the T@F website: “In this contemporary re-imagining of Cyrano de Bergerac, Cy (Jaryn Wilcox), a former Army sergeant kicked out under “Don’t Ask, Don’t Tell,” takes on the world with her words as a blogger, blowing the whistle on sexual harassment within the Army and going toe-to-toe with her former commander (Chris Van Hoy).” Cy is in love with Rose (Evelyne Cardella), a waitress with an artist’s soul, who is crushing on caveman-child military grunt Cole (Will Jobs). Cy begrudgingly agrees to pen articulate love missives to Rose on Cole’s behalf. 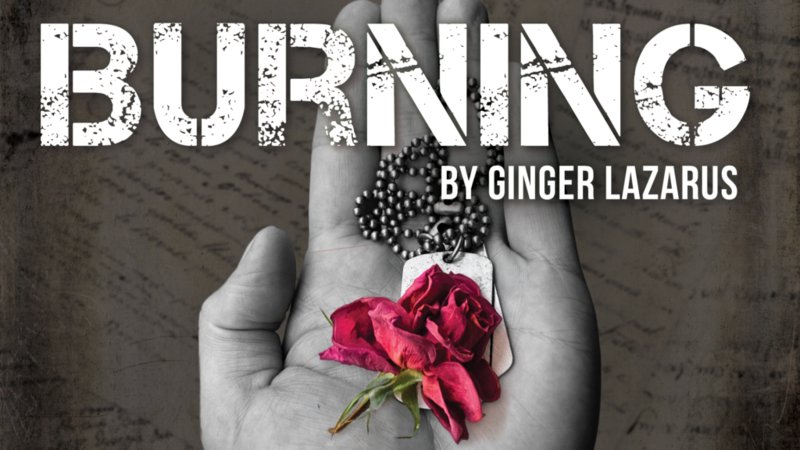 Burning confronts LGBTQ+ issues of silence and harm, assault in the military, hierarchical abuses of power, and domestic violence. It’s only a little romantic. The cast of Burning took some time to warm to its audience but, once it did, it gave us a great performance. Wilcox is austere but sympathetic as Cy. It’s clear from Wilcox’s portrayal that Cy is not one to take any situation lightly. Even lighthearted fun is a serious issue. Cy needs more fun, not another attack from Dulac. Cardella as Rose is as vibrant as any thirsty flower right before strangulation by weeds. She can do so much better than Jobs’s Cole (but not the other way around). Loneliness is what drives them together. If her choices are Cole or Dulac, she made the better one. The odds might be good but the goods are depressing. Miles Taylor’s Sammy is the sane contrast to Jobs and Van Hoy’s toxic masculine characters. Sammy gets beaten up, chased out by friends, and berated by everyone. Taylor plays Sammy like that cute kid without enough edges from your hometown that you hope got out. He’s sweet and too smart for his own good. Notes to the cast and crew: actors should take care with where they stand before scene changes. Audience right can see anyone standing directly behind the stage left glass window. It’s not as dark backstage as you think it is. We can see you, Fancy Hands. Also, the cast should please cheat out and/or pay attention to where a colleague is directing a line. Lines spoken directly to an actor upstage of them meant that the audience received that part of the play in profile. Burning appeared off-Broadway in 2016 since its premier in 2013. For those who didn’t catch the original premier and were disappointed by the New York production, Theatre@First offers the community a heartfelt alternative viewing. This one can’t compare to an off-Broadway budget but, as anyone who’s seen theatre in the Boston-area knows, it can compare in authenticity. Transparency disclaimer: I am besties (forever) with playwright Ginger Lazarus. The article considers this. This entry was posted in Drama and tagged Andrea Humez, Burning, Cyrano de Bergerac, domestic violence, Ginger Lazarus, Kitty Drexel, MA, Meg Boeni, Nathan Johnson, Somerville, Theatre@First, Unity Somerville, victim blaming by Kitty Drexel. Bookmark the permalink.